I always think it’s fun to find out where writers get ideas for their books . . . that one thing that makes them pause and ask the question, “What if . . .?” That’s what happened to me while passing through Edinburgh Castle’s esplanade. 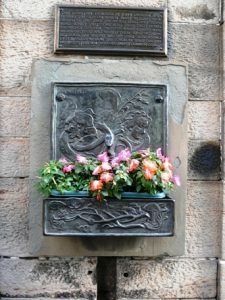 I came upon a bronze plaque and a fountain featuring two women’s faces—one old, one young—a foxglove plant in the center, and a snake coiled around it all. Gerri will join 40 other authors at a meet and greet event that is open to the public. She’s also presenting two workshop: Understanding Scene and Sequel and Mastering the Art of a Great Cover on Saturday, October 27th. For further information check out www.gsrwa.org. Gerri will join 60 other authors at an Autograph Party that is open to the public. She’s also presenting two workshop: Creating Character Emotion and The Business Side of Romance and Women’s Fiction on Saturday, September 15th. For further information check out www.pnwa.org.